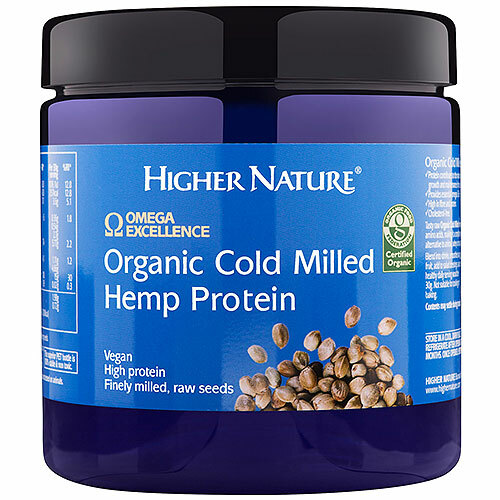 Higher Nature 100% certified Organic Cold Milled Hemp Protein is a tasty, raw and exceptionally high `complete` protein food – more even than meat, fish, eggs, dairy, and soya. It’s easy to digest and cholesterol-free too. Protein is an essential dietary nutrient made of amino acids, and provides energy, supports muscle growth and renewal, and contributes to bone health. Along with fibre, protein also helps manage appetite and weight by promoting a feeling of fullness after eating. Protein is present in vegetables, but is ‘incomplete’, so vegetables must be eaten together to make a ‘complete’ protein, such as beans and rice. Hemp seed protein is a ‘complete’ protein, meaning that it contains all of the important essential amino acids, which the body cannot make, so must be present in food. Hemp Protein is an excellent alternative to animal, whey and soya proteins, for people wanting to boost their protein intake. Ideal for vegans, vegetarians, people with active or sporty lifestyles, older people, dieters, when travelling, and after illness. This product is also suitable for Kosher and Halal diets. Hemp Protein is also high in important dietary fibre and healthy unsaturated fats. Fibre helps maintain healthy bowel function and regularity, normal blood sugar balance, and a healthy heart, arteries and immune system. Linoleic acid (Omega 6) is the most abundant unsaturated fat in Hemp Protein. It is important for normal metabolism, growth and development, and supports a healthy heart, arteries, blood flow, mental function and absorption of fat-soluble vitamins A, D, E and K. Hemp Protein also contains GLA, important for healthy hormone balance, skin, joints, immune system, cell membrane structure and function, and strong healthy bones. Omegas 3 and 9, and the mineral Iron, are found in Hemp Protein too. Omega 3 converts to EPA and DHA, important for healthy heart, arteries, brain and joints. Omega 9 supports a healthy heart and blood vessels. Iron is essential for healthy red blood cells, energy and strong immunity. This product is accredited by The Organic Food Federation. Organically grown raw cold milled hemp seeds. CONTAINS NO: Soya, wheat, gluten, maize, corn, yeast, lactose, dairy products, artificial preservatives, colours or flavourings. Take 30g per day. Blend into drinks, smoothies and yoghurt, sprinkle over cereal and fruit, add to salad dressings, sauces, soups, desserts, cooked pasta, rice and casseroles. Not suitable for cooking or baking, store in a cool, dark place. Refrigerate after opening and consume within 3 months. Below are reviews of Omega Excellence Organic Cold Milled Hemp Protein 250g by bodykind customers. If you have tried this product we'd love to hear what you think so please leave a review. Higher Nature Organic Cold Milled Hemp Protein is a tasty and exceptionally high complete protein food – more even than meat fish eggs dairy and soya. It’s easy to digest and cholesterol-free too.